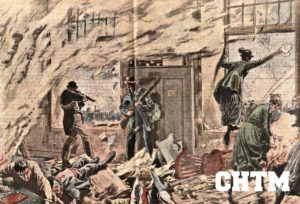 In 2014 a transcription of a newspaper article from Easter 1916 Jubilee Year was posted on the Custom House Commemoration Group Facebook page by member Áileen McMurray. With due credit and thanks to herself and of course her ancestor the original author, we thought a wider audience would enjoy a read. 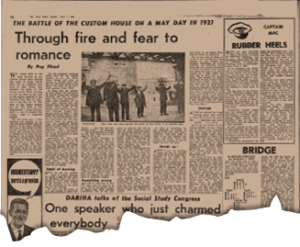 The Irish Press of 1 July 1966 published the reminiscences of a young female civil servant at work in the Custom House on 25 May 1921. As you will see, her story held far more personal and emotional memories than simply recollections of a major historical event which had exploded around her 45 years previously. Civil servants like the author being escorted under guard from the burning building. We junior girls in the Civil Service at the Custom House were making the most of those lovely days full of sunshine way back in 1921. Every free moment we spent on the tennis courts. Each evening at 4.30 we were on our way to the sports ground in the Phoenix Park. May 26 [sic], 1921, was a big day for us. The final of the ladies singles was on. The chief of our department – Local Government – was to present the winner with a beautiful trophy. The old cliché says – Man proposes, God disposes. In our case the girls proposed and the Leaders of the IRA disposed. This was D Day picked by them for the burning of the Custom House. The burning was aimed at ending for all time the last vestige of the so-called British rule. The Custom House, being the centre of British administration, such as it was, was to go up in flames. The IRA knew so well that in the bonfire would be lost all the files and records. That the beautiful building had to go was regrettable. We had organised ourselves pretty well for the smooth running of our day. Early lunch, change and away as quickly as possible after midday. We were all set for a quick getaway about 12.20. On going into the corridor we were amazed and alarmed to see several young men carrying revolvers and tins of petrol. Some were just patrolling – others were tumbling on the floor those precious files and records from the huge wooden presses which lined all the passage ways. When the papers were scattered around they poured petrol on them – then threw the wooden presses right on top and saturated them also. All round there was the same activity. What was going on? What was happening around here? We were ready to go out anyway. But the IRA thought otherwise. They courteously told us to return to the offices. We would be allowed to leave the building shortly. Apparently the IRA had taken complete control of the building. They were going to burn those records. The Custom House was doomed. We had no alternative but to return to our office. Later, much later, we learned that by noon all lines inside and outside the building had been cut. Nothing was left to chance. Even now, after all those years, I can plainly remember the panic and suspense as we waited. Soon we got the pungent smell of papers burning. We made a dash for the stairs on Beresford Place but a couple of IRA men stopped us and brought us to a room on the Quay side of the building. We were told we would be OK and allowed to leave very shortly….they had very definite orders – no casualties….. not to be alarmed, we would be OK. They were deaf to our pleas to let us go. With several revolvers in your neighbourhood there is not much you can do but obey orders. We piled into that little room – about 7 girls and a couple of men. There were only a chair and a small table in the room and one small window away above our heads. To take a peep we had to climb on the table. The men suggested we lie on the floor – just in case! As we lay there we prayed plenty and I would say none of us had ever prayed so earnestly before. We even tried to bargain with God. “Save us now and we will be good forever. Amen”. Save us from the Bonfire, we knew we were in imminent danger. At 1.30 we had been in that cubby hole for close on an hour. We got the ghastly smell of papers and wood burning everywhere. One of the men acted as a look-out and told us the whole blooming place was just going nicely – a beautiful bonfire. In turn we all had a look. Wide tongues of fierce flames hungrily consuming all before them. The top of the Custom House was a flaming inferno including the part we had so lately vacated. The fire was approaching the far end of our wing. We made an effort to get away while our legs could carry us only to find the door locked. The men were about to try to force the door when we heard the rat tat tat of a machine gun and the whine of an odd bullet. Horror stricken we now realised the British army were in on the job in our vicinity. Something had gone wrong for the IRA. On looking out we saw several British soldiers in the quadrangle, also those lawless, ruthless Black and Tans. Our wing was now burning brightly but it had not yet reached our hideout. How long before it would? In spite of everything we felt confident of escape. A couple of the girls were nearly hysterical. The men tried to cheer us up. The suspense was awful, just lying there praying and hoping. A pall of smoke lay over the area. About 2 pm the shooting eased off and we thought we would try to get somebody’s attention to our plight. Our look-out man was now at the window with his hands up and waving a white handkerchief. He was spotted, the window was shattered – showers of glass fell on us. A khaki clad soldier climbed in the window followed by a few others. They shouted at us to stand up and put our hands up and keep them up. We told them we were staff and wanted to get out before we smothered. They burst open the door and we were marched out on the quayside with our hands up. Not so evident was the fear and terror in our hearts. They tried to check our identities. Not an easy task for them or us, for in our hurried exit from upstairs we had brought no personal belongings, not even handbags. We identified each other and the various branches in which we worked. They must have liked the look of us girls, because in a little while we were told we were free to go home. They warned us about the danger of stray bullets from “those dirty Irish”. Little did they now that our sympathies were all with the Irish even though we worked in the British Civil Service. As you know, in those days sympathisers to the Cause were found in the most unexpected places. They even told us the direction to take for a safe getaway. But the staff got quite a bit of a grilling before they were freed. At 2.20 we watched our wing burning madly. How lucky we were. All of us on the quayside…… unharmed and alive … ALIVE … A L I V E.
As we left the vicinity of the blazing building, we saw a long line of brave young Irishmen with their hands up and their caps well pulled down. They were surrounded by Black and Tans. They had been captured in or near the Custom House and were being held for questioning. We saw them being hustled into Army lorries. Their destination – Mountjoy Jail. These valiants would now face the usual farcical trial by British Military. The Truce of July 11, 1921, was a helpful factor in the postponing of sentences. Lucky for me, too. For in that long line stood the man whom I was later to meet and marry. He had got a death sentence. He was one of nature’s gentlemen. Can I say more? He was blessed too with a very keen sense of humour. The author of the above article was a widow in 1966. On 25 May 1921 she was a single woman named Peg Mullane. Margaret Mary ‘Peg’ Mullane (23 June 1898 – 29 November 1973) from Rathvilly, Co Carlow was a daughter of RIC Sergeant Denis Mullane, and Mary née Forde. Her father was retired by 1905 so did not have to take part in the Tan War as a policeman. Peg paints a vivid picture of what she, some colleagues and IRA men went through in 1921. Understandably there was no mention of a minor item, her compensation claim for £5 worth of “ladies apparel” left in her office and burnt in the fire. She, like many other colleagues, did lose personal possessions during a very frightening and unforgettable day at work. After all, two male Custom House workers died violently and others suffered bullet wounds during the gun battle. Who says all civil servants have always led quiet, boring existences? She also gives us an idea of the real loyalties of many Irish crown employees in those times. Her comments many decades after the event about where her sympathy lay may be viewed by some as ‘politically wise’. However, during the Anglo-Irish conflict a lot of civil servants really did our future state some service in forgotten and unrecognised ways. 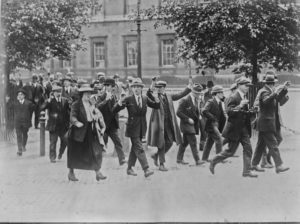 It is a reminder that the outcome depended on more than those who fired a gun or threw a grenade; and, as Peg suggests, a wide cross-section of Irish society did support separation from the UK. 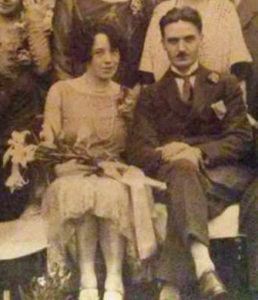 After the Tan and Civil Wars were over, Peg Mullane was married on 28 April 1926 in Athy, Co Kildare. Her groom was a certain Tom Flood, one of the men she saw under arrest at the Custom House. Seems she had definitely forgiven him for burning her office, coat and handbag and wrecking her tennis plans back in ’21. The couple lived in Athy until Tom’s early death in 1950 after having five children. Peg doesn’t confirm the lovely romantic family stories passed down about how she and Tom fell for each other. Her future husband spotted her in the Custom House. While scouting prior to the attack. Or on the actual day itself. And fell head over heels for her. Or it was a mutual attraction on the spot. The lady has given her side of the story – far be it from this writer to question that! Whatever, the Flood-Mullane romance and marriage was undoubtedly a very happy outcome for themselves and their families. Anyway, in the writer’s opinion there must always be room in history for family stories. They add colour and human interest. If we all stuck to the cold facts alone, the past would be a very dull, distant place. And sometimes family lore can reveal truths concealed in official records. On that topic the next post here – coming shortly – will focus on a couple of mysteries surrounding Tom Flood. I remember dealing with this news paper article back when it first came out. I remember trying to contact the author at the time, but to no avail. The photo used then was one of the worst un–clear photos. of the whole operation. There are photos that are quite clear of this group around. Asking a person who was there at the time what they thought of the story. They were embarrassed by it .It was not what they remembered of the day. Had he any idea why they would write such an article. ? This person was a neighbour of the Flood family, They were with him when Tom was being questioned and tortured before he was sent to the final place to await his trial. With the passing of time I had forgot it until I have seen it here. Just to add to Gary’s reply to your very interesting comments – for which, many thanks. 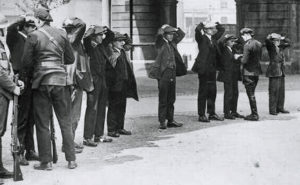 Our next article to appear this coming Saturday will include some clearer photos of the men under arrest by the auxies. Hopefully they will be of interest to you. As for the account by Mrs Flood, I’m sure you appreciate it was personal to herself. Her view of events was limited by her location and her story is similar to other civil servants caught up in the event. As you know, at almost any happening, different eye witnesses give different stories. We’d be delighted to hear more insights from yourself into the IRA experiences at the Burning – you obviously have great sources. We look forward to further inputs from yourself.